A little rain couldn’t flood the Fairgrieve farm and prevent the school’s Harvest Festival from being a success. The annual event was moved indoors where students learned the importance of farmers and their work, crops farms produce, the roles animals play, safety practices and harvesting crops. The school’s gymnasium served as an imaginary farmland, where each student from all classrooms were handed a card that indicated which fruit or vegetable they were to harvest or select from designated areas. 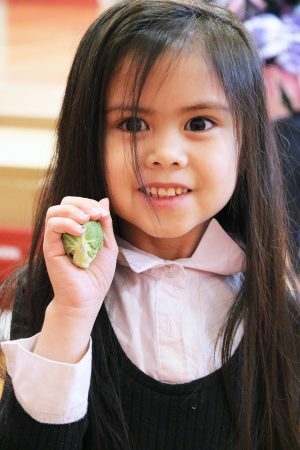 When Lucy Hawthorne’s kindergarten class visited the Fairgrieve farm, she reiterated new vocabulary to them, such as the word harvest, and had students practice sounding out the names of each produce. Principal Jean Sampsell said all fresh food was packed in boxes, decorated with a note from each student, before representatives from Catholic Charities of Oswego County, based in Fulton, picked up the goods for its local food pantry.